Nobody wants to watch a couple fat guys throw wild punches at each other inside a cage, right? I mean this is the UFC, not a hillbilly barroom. Wait…now that I think about it, there’s one particular fat guy fight most of us would LOVE to see. 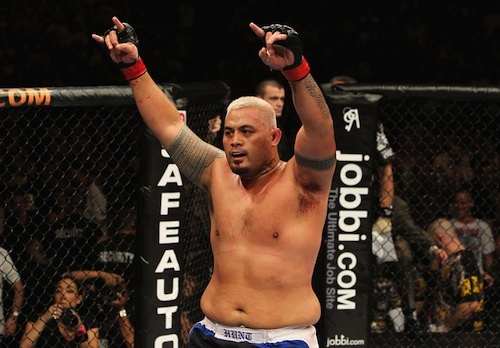 How ‘bout Mark Hunt vs. Roy Nelson? Sign me up! Hunt appeared on The MMA Hour and spoke about returning to the cage and he says he’s already accepted a proposed fight with “Big Country” in Japan, which he’s dubbed the “Battle of the Bulge.” This is a fight we’ve been hoping to see; not for the visual aspect of seeing two beefy dudes throwing bombs, but because it’s an incredible matchup between two very good heavyweights. Hunt also spoke about why he turned down a fight with Brendan Schaub—in New Zealand no less. And the reason is EXACTLY what you think. “No disrespect to Brendan, but I want to fight some of the top guys, I mean in the top 10. Fighting Schaub would probably be going backwards, so it is what it is.” He was very diplomatic in that comment, but I’ll say it…fighting Schaub would be a BIG step down for Hunt. Although everyone loves a good knockout, and the probability of one in that fight would be somewhere just south of 100%. Nelson is coming off a devastating knockout of Antonio Rodrigo Nogueira last month that snapped a two-fight losing streak. Over his UFC career, he’s easily dispatched of most mid to lower level HWs, while struggling only against some of top names in the division. Hunt has a loss to Junior Dos Santos (who also defeated Nelson) and a draw to Antonio “Big Foot” Silva in his last bout. The latter was considered one of the best fights of the year. A matchup of these two is sure to feature some serious fireworks.